Check this affordable mobile phone with competitive specs that will definitely give you more savings on the expected budget for buying new smartphone- the SKK Mobile Titanium. 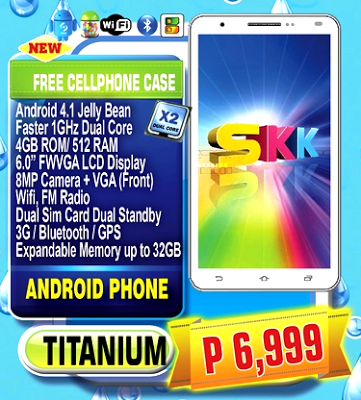 SKK Mobile Titanium is powered by 1GHz Dual Core and runs on a Android 4.1 Jelly Bean. It also features 8MP Camera + VGA (Front), 4GB ROM paired with 512 RAM, WIFI, Radio, 6.0 LCD Display and others. Other than SKK Titanium, you can also check the K-series, F-series, T-series, W-series, Radiance, Impulse, Sliver, SKK skypad like Skypad Sketch, Skypad Express, Skypad Dawn, Phoenix, Cyclops and Skypad Ultra. You can go to the nearest SKK store because they have some of the models that you can play around. For more details, blog and review about SKK Mobile Titanium, check out SKK Mobile website and their Facebook Page or visit the nearest SKK Mobile store, kiosk and accredited dealers for other inquiries.